So much awareness these days, (to my delight), is about rectifying the gender imbalance in the work place across pretty much all industry sectors and tech is no exception to jump onto this band wagon. Yay (so I thought). Accommodate the needs of all women, especially mothers as research has shown that after kids, women tend to stop working because of family responsibilities, let’s be truthful, childcare is expensive, irrespective of the country you live in. I lived in the UK and every time my kids were ill or I had to take a sudden days’ leave for family responsibilities, I still had to pay the 40 pounds per child per day whether they attended or not. Help keep women in senior or executive positions because again research as shown that the higher up the corporate ladder you climb, the fewer women there are, so access to mentorship and career development is taking a focus to keep women in these positions and also help them progress. So 3 out of 6 companies (50%) that were recruiting females highlight “Equal Pay” as a benefit? Could this be any more patronizing? Let me be clear: I embrace both my role as career woman and mother with equal vigour and take them equally seriously. Why then in the workplace should I be placed at a distinct disadvantage simply because I am a mother? Is the message of our day to women that “we can have it all” and are expected to actually; when in fact the truth is we experience discrimination when we embrace both career ambition and motherhood? Pay people according to their skill level and competency to do a job, and not based on gender. This should be your company standard policy, not a damn perk! Have women (if you have any in senior positions) talk about why it is a good career move to join your company. Don’t send men with limited people and communication skills to regurgitate tech terms in your company pitch. We are women in tech with experience attending these events, we don’t need to be mansplained to. If you need to schedule women only events, make the atmosphere inviting, don’t run it like a men’s event. Organisations like Silicon cape and Lionesses of Africa do a pretty good job of creating a warm community so perhaps take some tips from organisations like these. Lastly, as mentioned I am very pleased to see an increase in initiatives that empower women and that there is now an awareness drive to promote women in male dominated fields, but if you are going to do this, make an effort to do it properly. 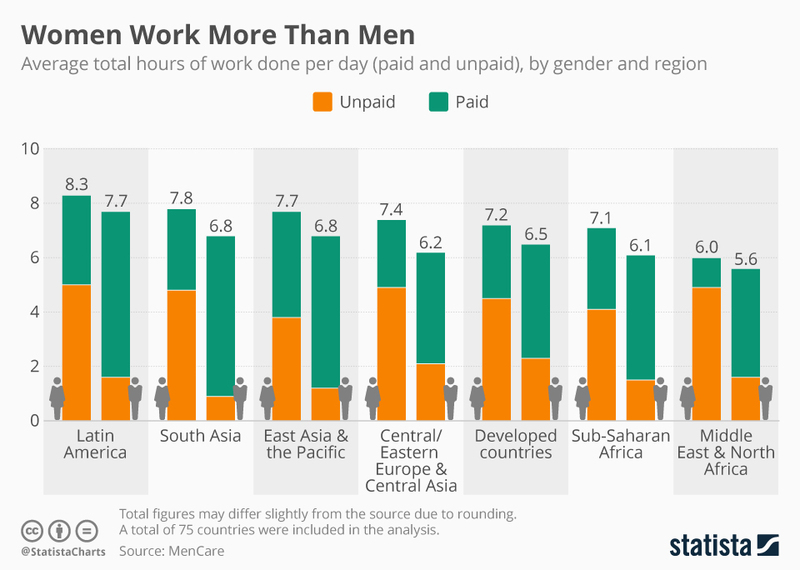 These are the current stats from Statistica.com on the average hours done per day (paid and unpaid), by gender and region. I am optimistic and hopeful that these numbers will change for the better especially for the next generation of women (as a mom of a strong willed 10yo daughter who believes she can be anything , I have to be optimistic) , however based on what I’ve seen, following the current script is a sure fire way NOT have any impact on the gender imbalance.